• Capacity: 2,000 to 5,500 lbs. • Min. Platform Size: 24 x 36 in. • Max. Platform Size: 48 x 60 in. • Travel: 24", 36", 48"
• Capacity: 1,800 to 5,300 lbs. • Min. Platform Size: 24 x 48 in. • Max. Platform Size: 48 x 64 in. • Capacity: 6,000 to 10,000 lbs. • Min. Platform Size: 42 x 60 in. • Max. Platform Size: 60 x 60 in. 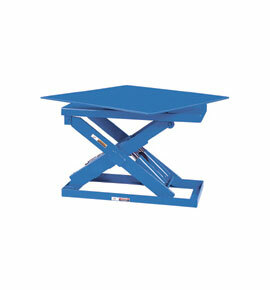 • Lift Table Size: 42 x 60 in. which can double or triple the life of a lift. • These units are equipped with single internally mounted power units. • All hydraulic cylinders are machine grade with clear plastic return lines. • These units are fully primed and finished with baked enamel.